Second attempt at this macro thingy! The photograph was taken using a Nikon D800, a Nikkor 50mm enlarging lens reverse mounted on a set of bellows, all mounted on a Wemacro rail. 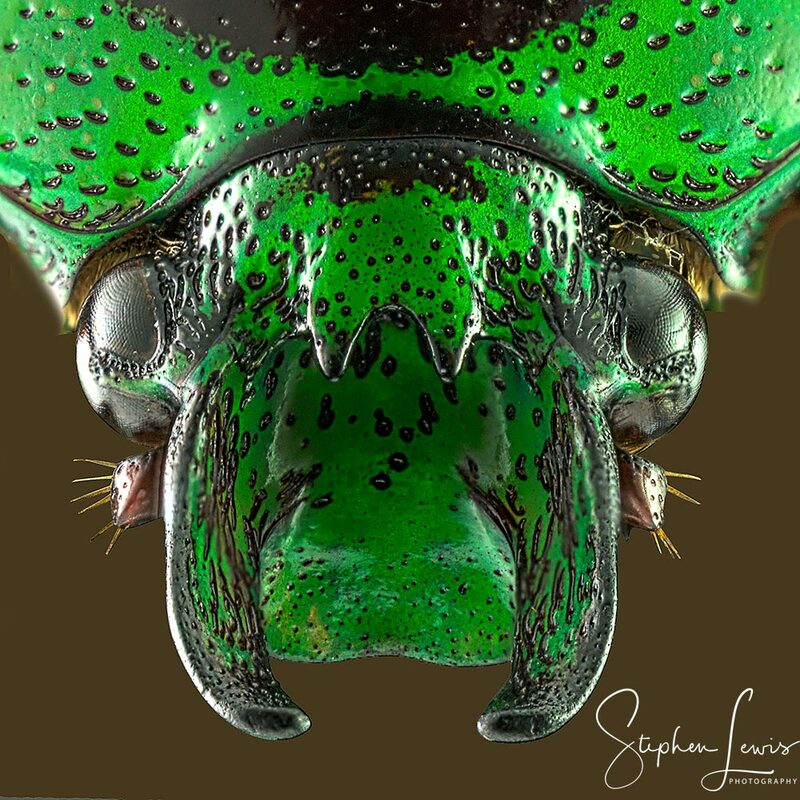 The subject was a Green and black horned beetle (Mystroceros rouyeri). The lighting was two flash units, which are new to me and took a while to fathom. I finished up with 90 photographs, which were divided into three stacks each with 30 photographs. Each individual stack was processed using Zerene Stacker to produce a Dmap image, and the three resulting images were then stacked into a final image using Dmap. The final image was processed using a combination of Photoshop and Topaz. Wow! Excellent work! Shiny beetles can be quite tricky. Why did you subdivide the images? How did you pick the dividing point? Being picky, there is a fuzzy patch about 3/4 the way up each "horn". Any idea why? Great work!! Only 2nd attempt....amazing results!!! After a lot of trial and error with my first effort I found that this method resulted in fewer artefacts. The split into three again came from experimenting as I found that anymore than 35 or so images also produced artefacts. I think that generally the fewer images stacked the fewer problems. I think that my starting point for focus wasn’t accurate enough, and the two out of focus areas are a result of operator error ! This is part way through the depth though, isn't it? ? Or, when you said 3 stacks, did you have to back off coarse focus and restart fine, or something? I'm just wondering if you were doing someting "odd".